News 2012 – Techcom – innovative solutions, absolute quality! Within the 11th International Workshop of Technologies, Equipment and Production of Steel Industry (ANKIROS 2012) held in Istanbul, Turkey from September 13, 2012 till September 16, 2012. The talks were held and the contract was concluded concerning the following issues: entitling the exclusive rights in sale of fireproof products; acting of the company Теснсом Gmbh for the company OSR – Orind (India) on commercial and technical issues at CIS and Romania enterprises. The products will be supplied at the enterprises with trade «ORIND – TECHCOM Group».Fireproof products were tested at the main fettlings of steel-pouring ladles of «Novorosmetal». Resulted average resistance was 146 fusions (average resistance at the enterprise is 145 fusions). As well, maintenance resistance was 527 fusions under fettling of working layer of woodchip board – 50 at “Electrostal” Ltd. (average maintenance resistance at the enterprise is 450 fusions). Testing of ASIS technology at woodchip board with cast weight 100 tons will be started at metallurgical enterprise Benteler Steel/Tube GmbH in Lingen /Germany in the middle of September. The results of testing are expected in the middle of October. August The contract for equipment delivery and collaborative sales of ASIS technology with company STEIN Injection-Technology in Gevelsberg /Germany has been concluded. Testing of single-channel blow-down component DVS was started for steelmaking optimization at JSC “Belorussia Metallurgical Plant” within joint program on increase of resistance of fettling components of steelmaking units and for optimization of energy and technological modes. Using of single-channel blow-down component will allow optimizing technological parameters of work with woodchip board and will decrease expenses for steel production with usage of bottom blowing method. The technology of injection of aluminum granulated material into stream of metal when running out from steelmaking unit (ASIS technology) is developed successfully at EC enterprises. For example, the contract for equipment delivery and implementation of ASIS technology at Benteller Plant (Germany) was concluded after testing and confirming the economy of Al for initial disoxidation. The project is designed and the equipment is installed for starting the tests in converter workshop of the plant Salzgitter Flachstahl GmbH in Salzgitter/Germany. Testing of ASIS technology at converter with cast weight 220 tons was started in the middle of August. The results of testing are expected in the middle of September. Tests of periclase-carbonaceous fireproof items for fettling of steel-pouring ladles of Теснсом GmbH delivery are being continued at metallurgical enterprise «Novorosmetal», Novorossiysk city. Service durability of the two sets tested in August, 2012 was 139 and 148 fusions for each one. Those tests confirmed guarantee factors and quality of the materials supplied by Теснсом GmbH at the enterprise. The conclusions as for applying APS technology in converter workshop of the enterprise were made within joint program of JSC “NTMK” and Теснсом GmbH for optimization of expenses under out-of-furnace steel processing. On the ground of reached factors concerning decrease of power consumption for out-of-furnace steel processing this technology was solved to be included into investment program of the enterprise and all the units of out-of-furnace steel processing were solved to be equipped with APS technology. The first tests of tight bottom immersion shell were held at Metallurgical Enterprise Georgsmarienhutte. The first series of tests were held when dispensing the steel of qualatative sortament. In the results of estimation of dispensed steel the decrease of non-metal agents by 90 % was marked! Data as for metallographic research will be represented after completion of the tests scheduled at the end of March 2012. APS technology developed by the Company Techcom GmbH has been implemented since January 2012 in converter workshop of JSC “EVRAZ NTMK” at the area of out-off-furnace processing of steel in steel-pouring ladle of 160 tons. 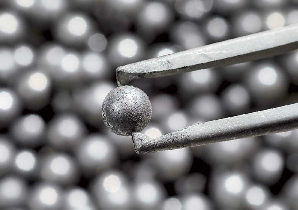 This technology will improve the technological processes and decrease cost per unit in steel producing sphere. It will be possible because of decrease of processing time, power consumption, consumption of alloying elements and ferroalloys. The equipment was adjusted for APS technology and tested while cold starting. Argon blow modes developed by the Company Techcom GmbH were tested during pilot fusions. The received initial data show promising outlook of APS technology for out-off-furnace processing of metal while producing the various range of metal at JSC “EVRAZ NTMK”.